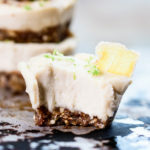 Flavored with essential oils, these no bake lemongrass cheesecake bites with candied ginger crust are delicious and vegan too! Place all crust ingredients in a food processor. Blend until crumbly and the mixture sticks together when you squeeze. Place 2 t. of crust mixture in a mini muffin tin that has been sprayed with coconut oil. Press mixture down firmly. Place in freezer until crust is slightly firm . Place all filling ingredients in a high speed blender except the essential oil. Blend until smooth and creamy. This will take some time so you will will want to scrape down the sides periodically. Add essential oil and blend until combined. Set Aside. Remove crust from freezer and place approx. 1 T of filling into each cup. Enough to fill. Place in freezer until set and somewhat firm. In order to remove from tin, run a knife around the edge until released. Enjoy! Store left over cheesecakes in the fridge until ready to eat.